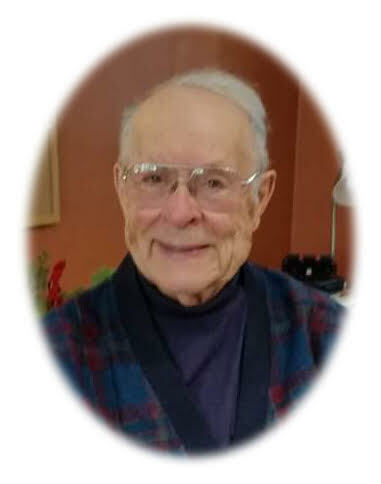 William Victor "Bill" Schleppegrell, 95, longtime Hibbing resident died Thursday November 29, 2018 at Fairview Range Medical Center in Hibbing. He was born on September 3, 1923 in Minneapolis, Minnesota to Victor and Marie (Britton) Schleppegrell. After growing up in Littlefork, MN, he enlisted in the U.S. Air Force in 1941 and became a fighter pilot against the Nazis. His plane was shot down over Germany on January 1, 1945 and he spent the remainder of the war in a prisoner of war camp. After returning from the war, he became a German teacher to promote better international understanding. He married Norma Walters on August 28, 1948 in Minneapolis, MN. He taught German at Hibbing High School for 36 years and was Dean of the Concordia College German Language Village for ten years. He was a member of the Hibbing Curling Club, Hibbing Rotary, Algonquin Club, and a past member of the Silica Volunteer Fire Department. Norma and Bill were both inducted into the Hibbing Historical Society Hall of Fame, and Bill was a past Titan of Taconite. After his retirement he continued to work for peace and justice, volunteering for his church and in his community, including playing the piano at local nursing homes. He is survived by his wife of 70 years, Norma, son Bill Schleppegrell and Nancy Nelson, daughter Dr. Mary Schleppegrell and Dr. John T. Rowntree, daughter Betsy (Schleppegrell) Moore and Michael Moore, son Tom Schleppegrell and Susan (Bugliosi) Schleppegrell, son Steve Schleppegrell and Kathy Laffin and daughter Patty (Schleppegrell) Zbacnik and Jeff Zbacnik, foster daughter Kathy Iverson; 14 grandchildren; 28 great-grandchildren and many dear friends. He was preceded in death by his parents, his aunt, A. D. Schleppegrell; a sister Marilyn Westmiller, his son, Larry, an infant daughter, Margaret; and an infant grandson, Anthony.